It was the beginning of a new century and Maryland was a key player in the transformation of the U.S. economy from one based on agriculture to the new industrial age. The steel, tanning, clothing, and tobacco industries were being established as new technologies like steam engines, electricity, railroads, and telegraphs enabled new levels of scale and efficiency. While our history book states that “accounting records have likely been used in Maryland since its settlement in 1634”, the need for accounting skills greatly increased with the size and complexity of the new industrial companies being formed. There were a group of seven “accountants” with ties to other accountants in New York and Pennsylvania where CPA laws had just been passed, who came up with the idea of starting the profession of Certified Public Accountants in Maryland. They recognized the growing need and importance for the discipline of accounting and a need for certification due to the public interest of financial records. That group of seven were led by two men, Frank Blacklock and Max Teichmann, who would go on to propose a CPA law in Maryland. Teichmann and the group of seven lobbied the legislators and went on to successfully pass the bill in the House on March 7, 1900 and in the Senate on April 2, 1900. Our history book then cites that the April 15, 1900 edition of the Public Accountant (the predecessor of our Statement) notes that, “late in the evening of April 10th, 1900 Governor John Smith of Maryland signed the bill…and the same became the law of the State of Maryland.” Maryland became the third state in the nation to pass a CPA law and the Maryland Association of CPAs was formed shortly threrafter. April 10th, 1900 marks the birth of our association and the CPA Profession in Maryland and today we celebrate 114 years! We continue to carry on that mission today and our work in the Maryland legislature to protect the CPA License (see our latest session report, No House of Cards, but CPAs are fine). Think about where we are today, just fourteen years into another century and on the brink of a major shift change as a whole generation turns over the reigns to the next and as technology is changing the business landscape faster than we can imagine. Will accounting become more or less critical in this new “knowledge age”? What new laws and regulations might be needed or imposed on us in this rapidly changing world? Who will protect the Profession and the CPA License in this new era? As we look ahead in Maryland we see a historic turnover in our legislature coming this year as we will elect a new governor, attorney general and and an expected turnover of 40% of the 188 legislators in our general assembly. How many of these newly elected legislators will know and understand our Profession? That is why we are asking our members to make plans to attend CPA Day in Annapolis (January 29th, 2015 register here) to educate the new legislators about who we are as CPAs. We are also asking for support of our CPA Committee on Political Action (CPA/CPA). If not you, who will give us the “moral backing” of our association? 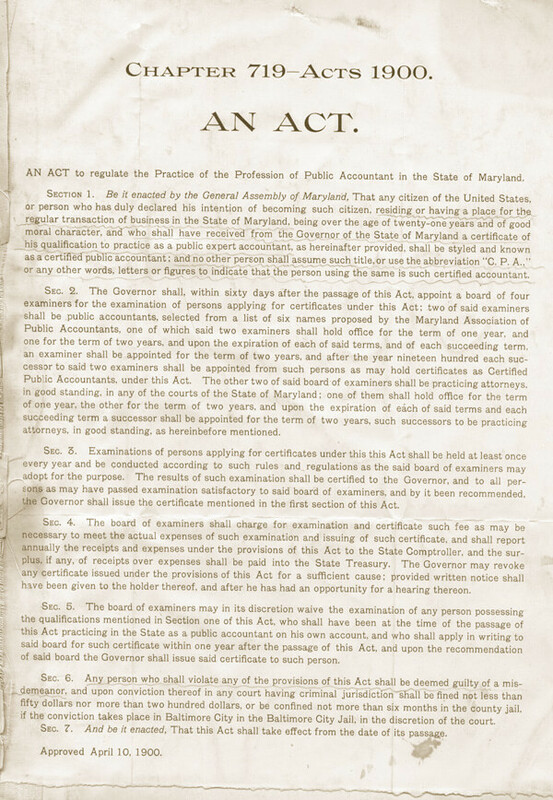 It seems that some things never change… Happy 114th Birthday, Maryland CPAs! State of Accounting: Can the ‘3rd Best Career’ Survive the Tidal Wave of Change? Special thanks to Dr. Stephen Loeb of University of Maryland who led the research and editing of our history and Dr. James McKinney of University of Maryland, our designated historian.